You know... sometimes you guys must think I don't have an original bone in my body, and there are certainly times when it's true and I look for the creative muse elsewhere. 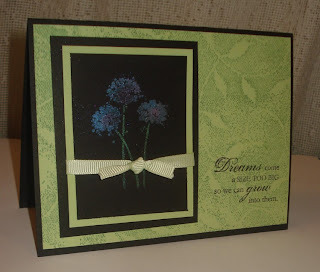 I am inspired all the time by the beautiful cards I get in swaps with other demos, and from the artwork shared on Splitcoaststampers and Stampin' Up! 's "Stampers Showcase". But OCCASIONALLY I come up with the odd idea or two that I can say came from my own wee noggin, and I'll be sharing some of those projects with you tomorrow. You WON'T WANT TO MISS IT... since there will be a SNEAK PEEK at some of the upcoming Spring Mini catalogue items in it (can I say... new punch??)! In the meantime, don't forget to double-check your Winter & SAB mini catalogues for last-minute items you need... time is running out and it'll be Feb 28 before you know it :) If you want more info on joining one of my Stamper's Club, please click HERE. Ooh, ooh, those new punches are AMAZING! Well worth going to Caroline's just to see the new Mini catalogue and the PUNCHES! Sorry I had to run from Stamp Club so quickly - I didn't get a chance to tell you how much I LOVE this card. The colours - they work so well. I've definitely got to pick up some of that - what do you call that stuff we coloured the floors with? Ooops - not floors (LOL!!!) FLOWERS. What did we use to colour the FLOWERS. Wow, this is a gorgeous card!